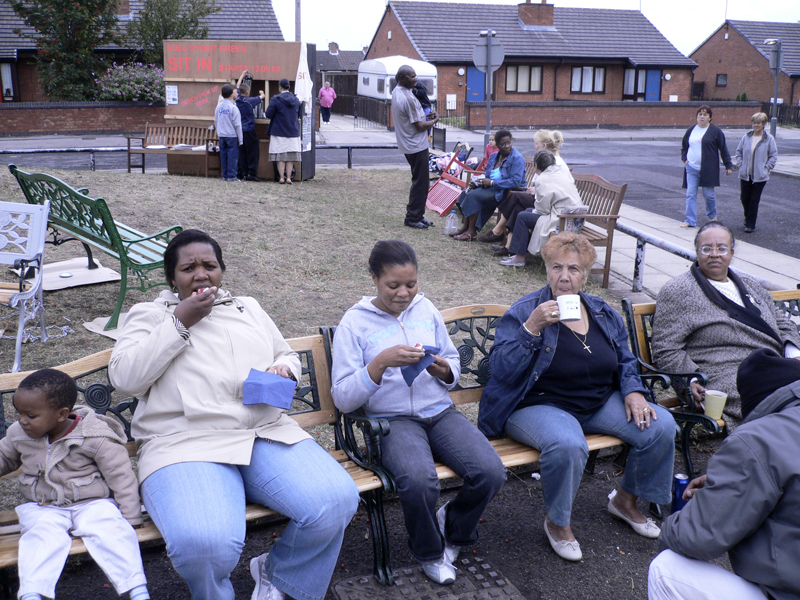 SIT IN is a site-specific project that took place between the 12th and 19th August 2006 on a neglected piece of land in Noel Street, Toxteth. Located within a Housing Market Renewal Area the Noel Street neighbourhood has seen significant amounts of housing stock demolition. In many cases this has created void spaces that further fragment the social cohesion of these inner city areas. The SIT IN project aimed to highlight the potential of these void spaces and the opportunities they might offer to local communities. SIT IN started with the question: WHAT IF these large areas of derelict and neglected land that characterise Toxteth could be utilised by local communities and become an asset rather than a space that divides neighbourhoods? SIT IN aimed to kick-start a process of change that could ultimately be sustained by the local population. 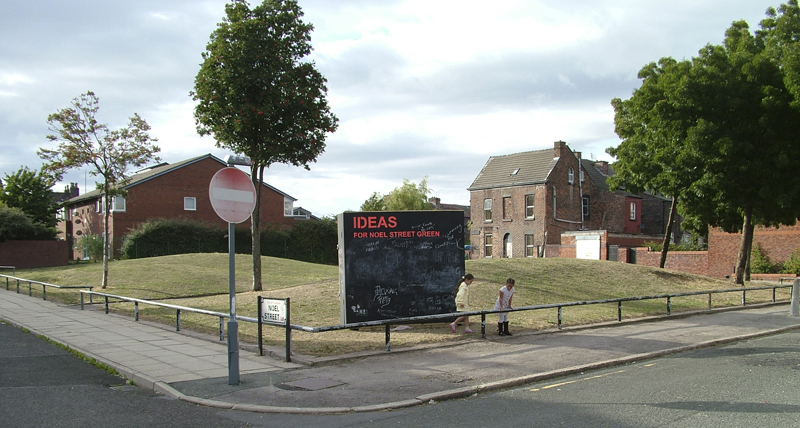 The role of what if: projects was to facilitate the engagement of all local residents in defining a new future for Noel Street Green. The SIT IN event involved the ‘occupation’ of Noel Street Green by local residents. 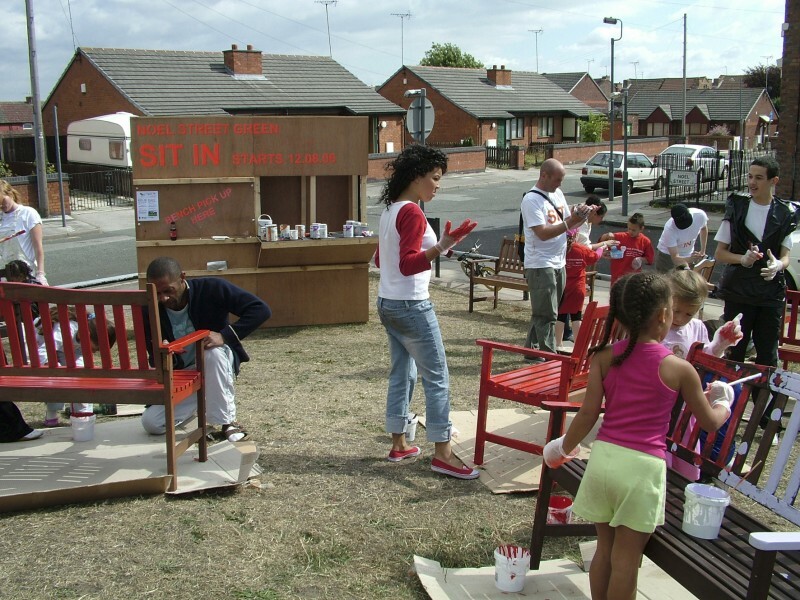 Each household was allocated with a free garden bench and throughout the week residents took part in a programme of events around their benches. The SIT IN event aimed to launch an open-ended process of change determined by the local communities needs, desires and abilities and further to nurture a sense of responsibility and care for the land. The team set out a coherent plan of action informed by the outcome of the SIT IN event and an additional workshop weekend with residents later that year. During the 10 day event a general lack of public meeting places and community focal points in Toxteth was pointed out as one of the mayor problem.